Shawna Wagner! You’re the winner of the FREE CRABS TODAY!! Please give us a call at 443-956-2722 to schedule a time to pick them up today. Happy..
Like, Share and Comment to WIN FREE CRABS on Sunday! Good Friday Specials and Weekend Preorders! LARGES $55/doz 2 doz $100 1/2 bu $125 1 bu $250..
Parkton optin.mobiniti.com	By participating, you consent to receive recurring autodialed SMS/MMS promotional messages. No purchase required. Msg&data rates may apply. Reply HELP for help, STOP to end. Rachael Portko! You’re the winner of the FREE CRABS TODAY!! Please give us a call at 443-956-2722 to schedule a time to pick them up! Thanks..
Best Prices Around. Guaranteed Not To Be Beat! 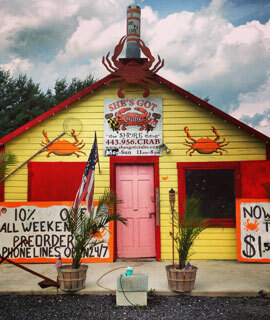 She’s Got Crabs is a family owned and operated business that has been serving the best and freshest Maryland crabs and seafood in Northern Baltimore County and Southern York County, since 2007. Try our famous steamed hard-shell crabs, succulent jumbo shrimp, Maryland style all-jumbo lump crab meat and soft-shell crabs. We are open regularly in the summer and even in the winter, rain or shine! In the summer, we get our crabs every day from Kent Island fresh off the boats coming in from the Northern Bay, Choptank River, and Wye River (home of the Wye River Monsters), Louisiana, or North Carolina. We cook fresh to order right in front of your eyes, steamed the original Maryland way. We will hand over the crabs still steaming and smothered in our own family blend of seasoning from J.O.’s. If you are looking for a caterer for your next corporate or private event, She’s Got Crabs friendly staff would love to accommodate you soon. Please visit our catering page for more info. Everyone LOVED the crabs! Said they were sweet tasting and good size. Also liked the corn! There were no crabs left and only a few ears of corn, so your estimation on the quantities we would need was right on! We told everyone where we got them and recommended you highly.